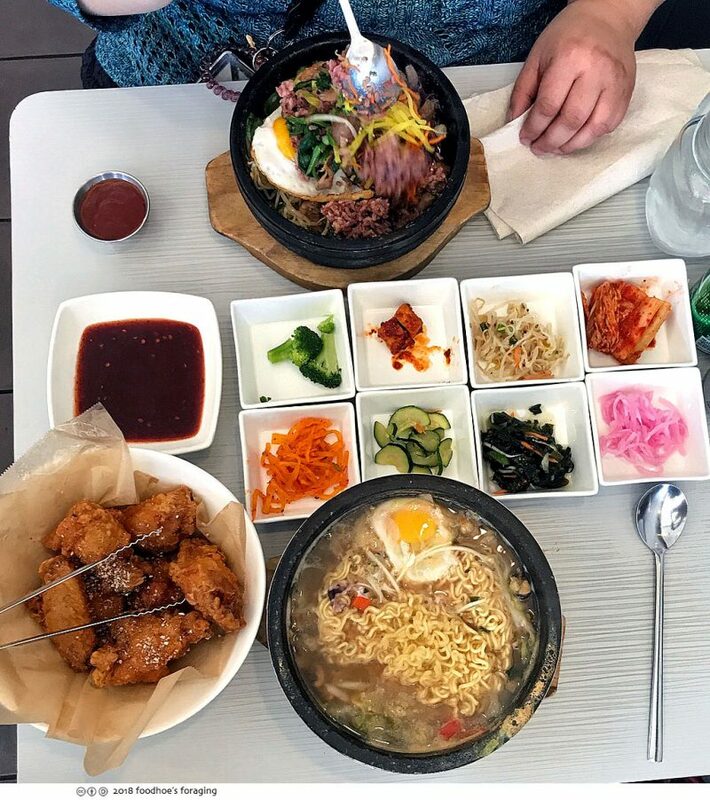 There are a surprising number of very good Korean restaurants out in Coco county, but this is my favorite one (of the type that doesn’t involve cooking yourself). 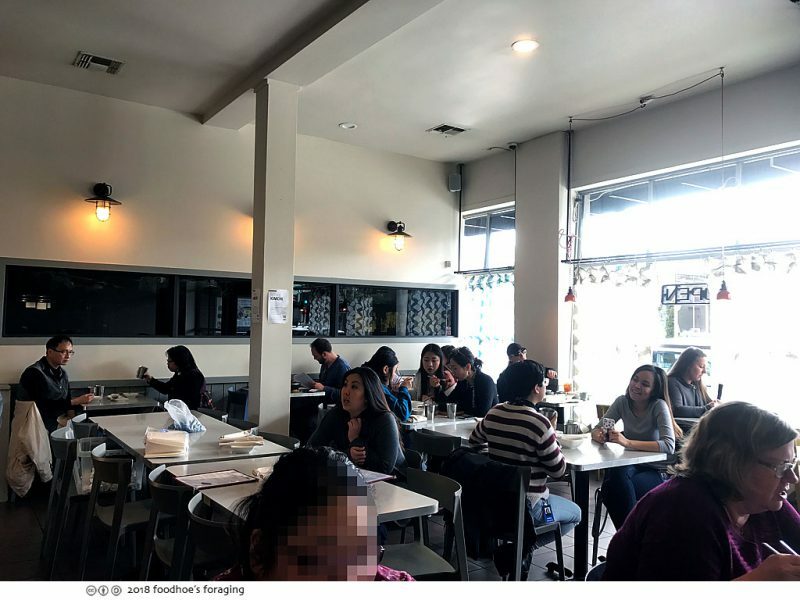 It’s tucked away on a side street off Locust in downtown Walnut Creek where the parking can be competitive and there’s often a line out the door, a sure sign that it’s good. Inside is bright and airy and the table service is generally attentive, although it can seem chaotic and busy as there are so many components to the meal and everything is cooked to order. 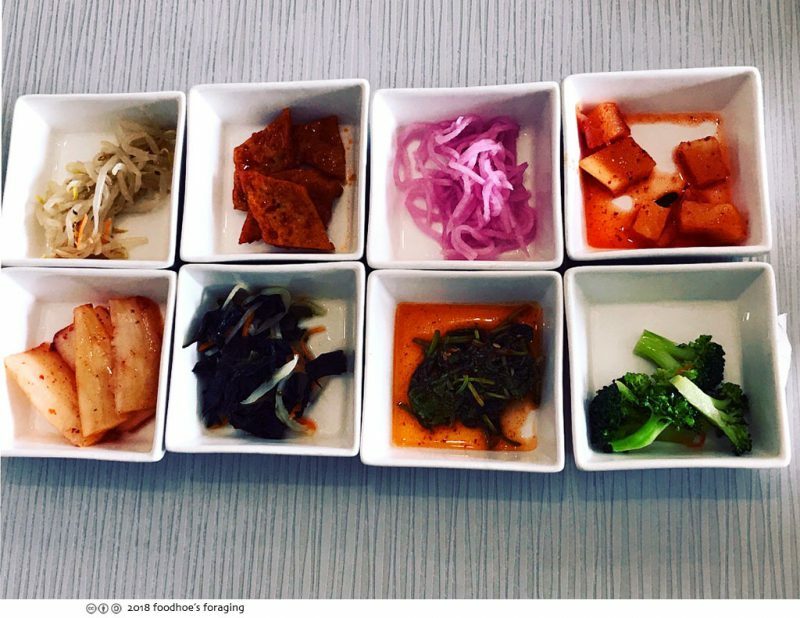 At the Korean table the meal always begins with an array of banchan, side dishes that complement and add contrast, that can also be used as condiments with the rest of the dishes. 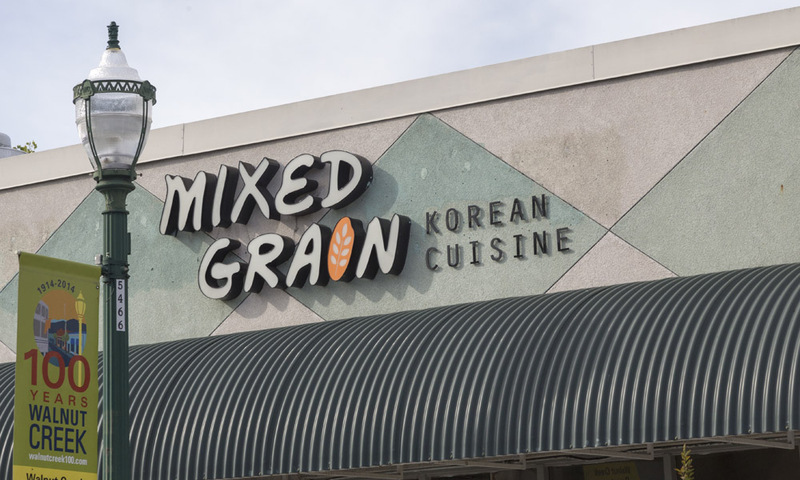 It varies from day to day, but there are almost always seasoned soybean sprouts, tossed with sesame, soy, scallions, and garlic, assorted kimchi, seaweed, pickled radish, seasoned fish cake, broccoli; offering a variety of spicy, sweet, savory and tart accents to round out the meal. 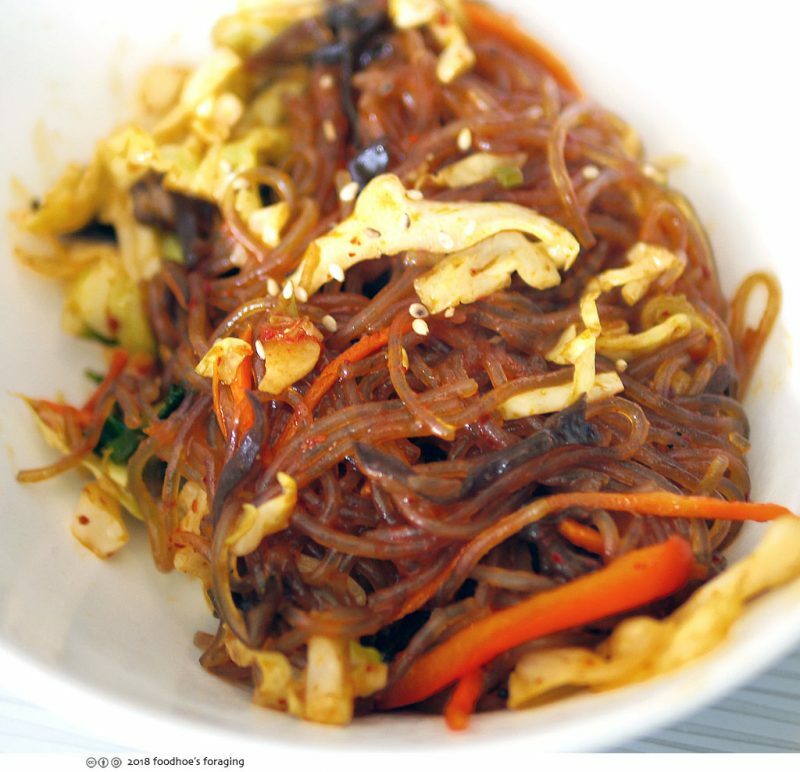 A classic dish to begin with is the veggie Japchae ($7) delicious and springy stir-fried glass noodles, mushrooms, julienned carrots, onion, spinach, cabbage, green onions, bell peppers drizzled with rich nutty sesame oil as well as toasted sesame seeds and a little bit of spice. You can add beef, chicken, spicy pork or tofu for an additional $2. 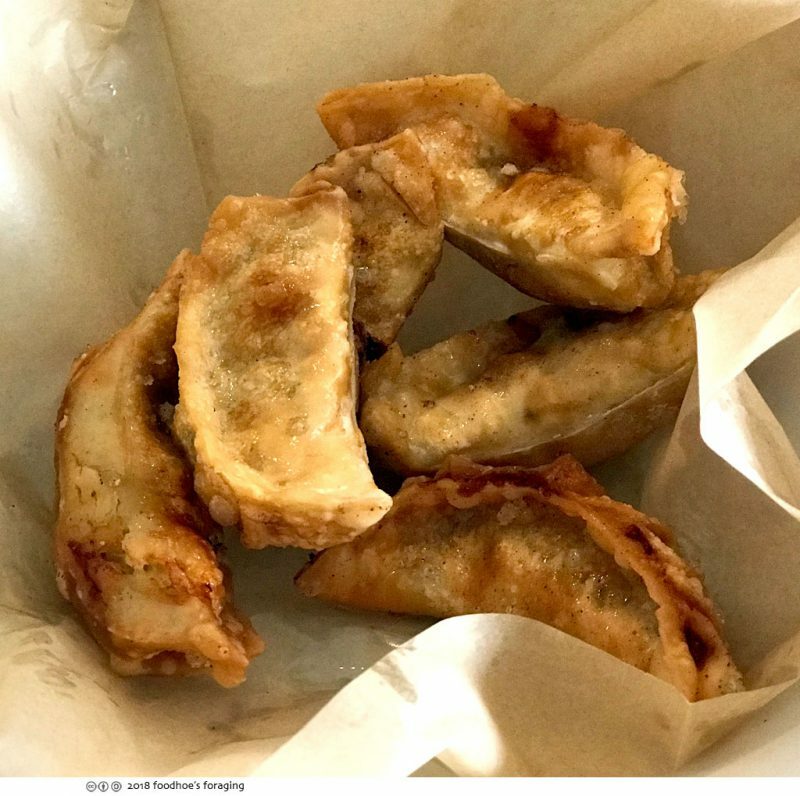 The Mandoo dumplings ($7) are made with a variety of fillings, veggie, kimchi, beef or shrimp and can be ordered steamed or fried, although the shrimp ones only come deep fried, juicy inside of the addictively crispy and thin wrappers. 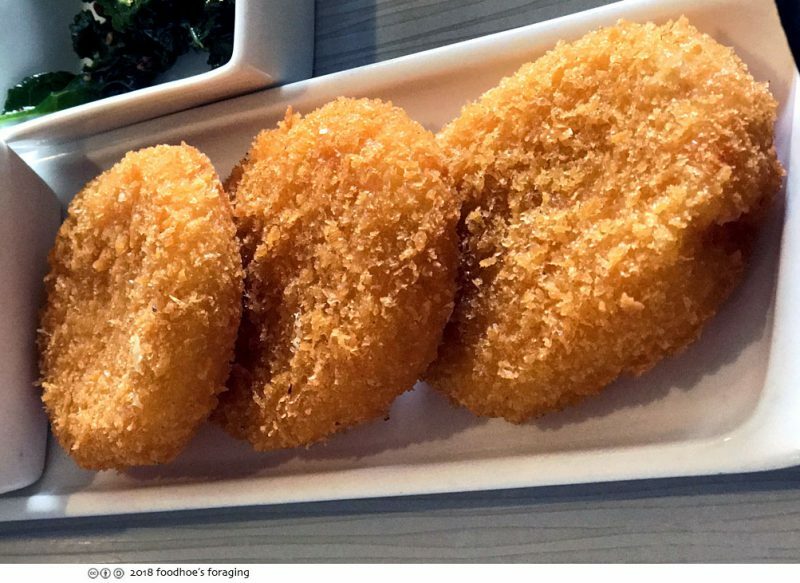 The potato croquettes are very filling, rich creamy patties made from mashed potato mixed with chopped vegetables and egg then coated with crunchy panko bread crumbs and deep fried. The chicken wings are why I love this place. 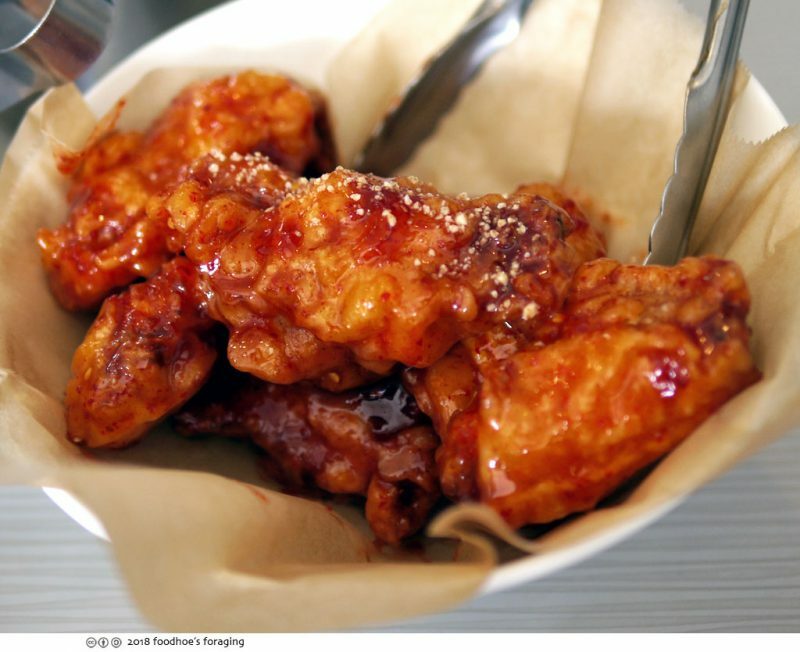 Korean fried chicken (kfc) is one of my favorite things in the world, and Mixed Grain makes some of the best. 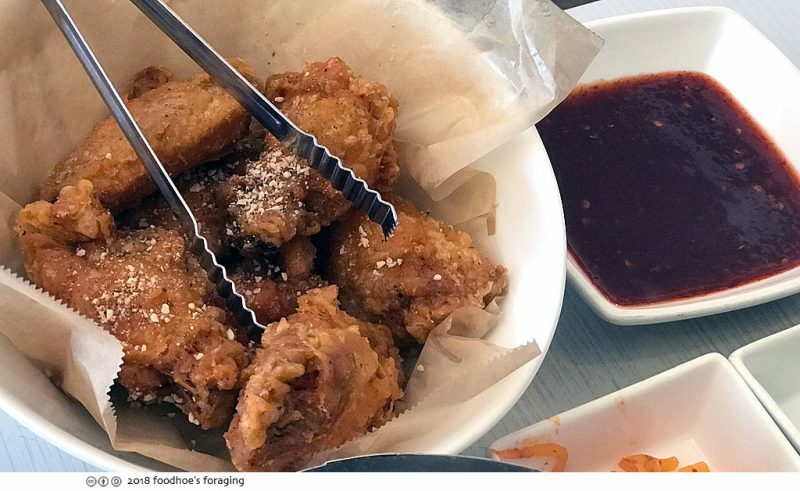 It has a crunchy eggshell-thin, ultra-crisp crust surrounding a delicious juicy interior, pictured here coated with their addictive sweet and spicy chili sauce. I must warn you that sauce is so spicy that you won’t be able to stop eating it or your lips might explode. If you’ve been reading my blog, you probably know that I’m a bit wimpy when it comes to chili heat… so I like to ask for the sauce on the side, which keeps the chicken from getting soggy and you can dunk into the sauce or drizzle on as you like. 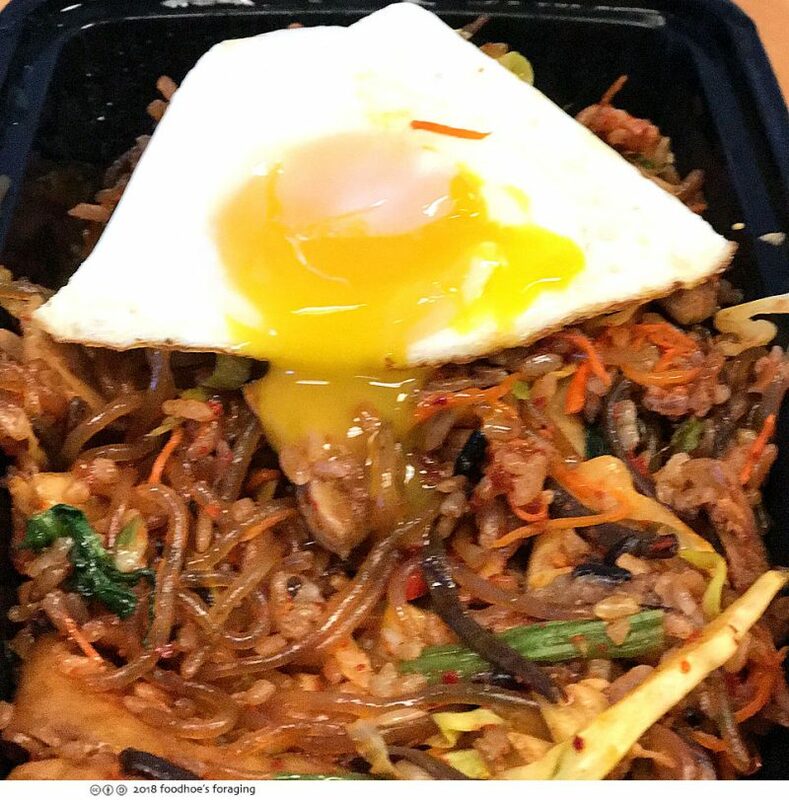 The bibimbap (pronounced “bee-beem-bahp) is beautiful and fresh tasting, a colorful array of 11 different vegetables including carrots, spinach, bean sprouts, cucumbers, zucchini, mushroom, radish and purple cabbage, choice of meat, arranged over steamed rice served in a sizzling hot stone bowl (dolsot), which continues to cook as you eat, forming a crunchy crust of toasted rice when you reach the bottom—delicious and moreish. You can choose white rice, or the special purple rice (the house namesake) of mixed grains (white rice, sweet rice, wild sweet rice, barley, brown rice and sweet brown rice). It usually comes topped with a fried egg and on the side, there is gochujang, the fermented, deep-red chile paste. 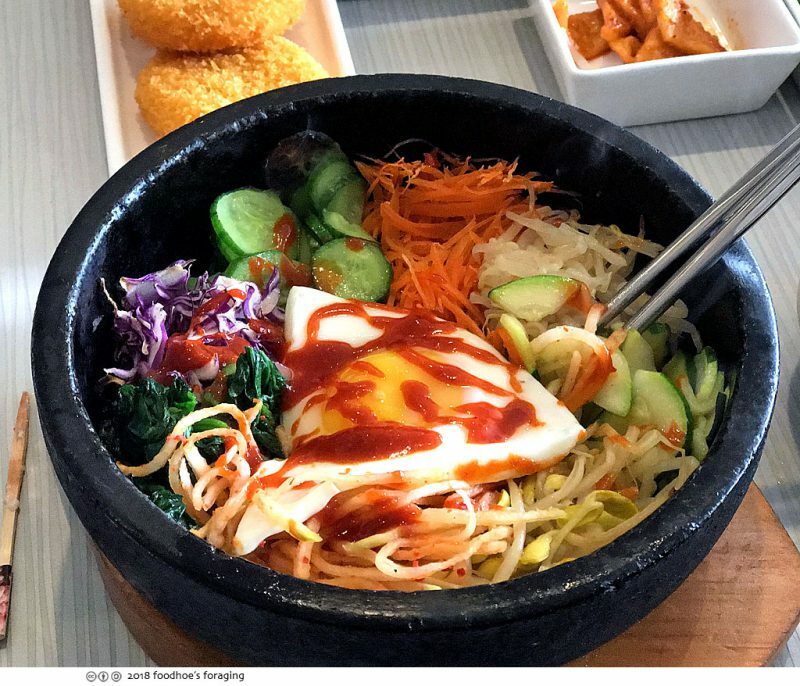 You drop in a spoonful, mix up all the ingredients (bibimbap literally means mixed-up rice), and then dig into a treasure chest of contrasting textures and flavors that warms you up beautifully on a chilly winter day. 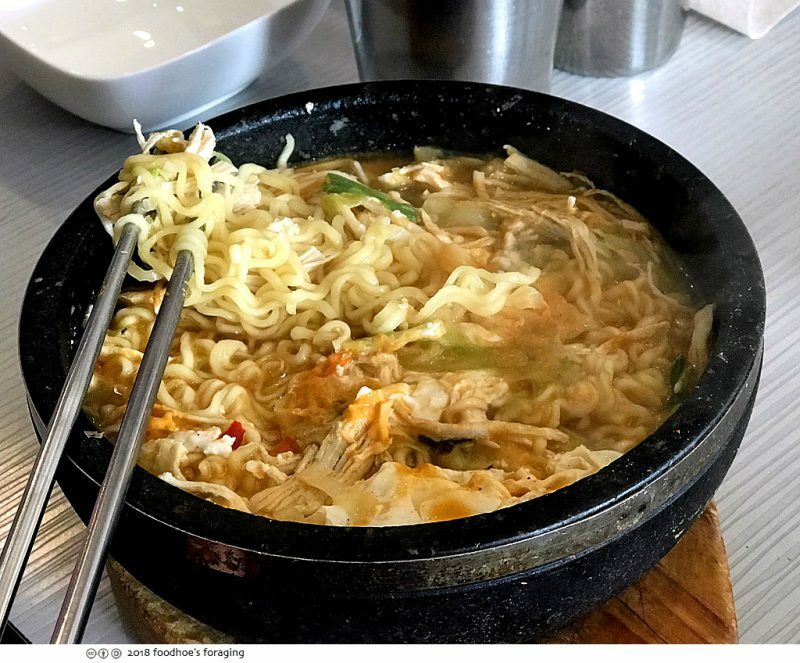 The menu has many wonderful dishes that I crave when the weather is cold, the spicy ramen is one that is sure to warm you up. It is served in the heated stone bowl that arrives bubbling and sputtering. The noodles are not made fresh daily, but I grew up on packaged ramen, so this is total comfort food for me and I think you’d agree it’s really good. The housemade beef broth is savory and can be made as spicy as you like it, with fresh vegetables (cabbage, carrots, green onions, bell peppers, onion) and a raw egg that turns into an edible egg blossom when you stir it into the molten hot soup. 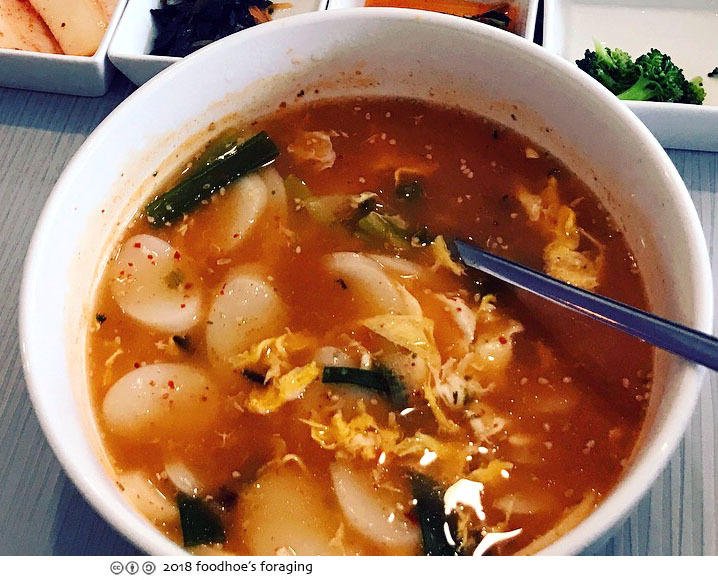 The soft tofu stew, Soondubu ($12) has a deliciously spicy broth that is deeply flavored and filled with custardy tofu that arrives at the table bubbling merrily in a heated stone bowl. It is also served with a raw egg to mix in and is full of vegetables (zucchini, onions and green onion) and protein to warms the belly and satiate the palate. You can add dumplings, shiitake mushroom, fish cakes, rice cakes and a choice of protein (beef, chicken, pork or seafood). The rice cake soup ($12) is a spicy broth full of sliced rice cakes with egg and green onions that had me smacking my lips, you can add beef, chicken or pork and dumplings as well. This is what a meal at Mixed Grains looks like, colorful and exciting and utterly delicious! 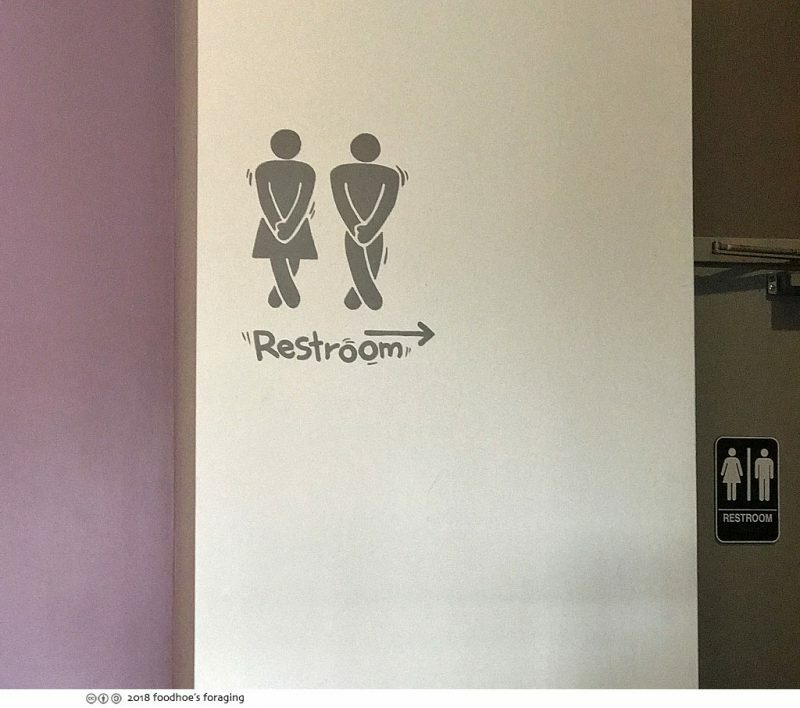 The hilarious sign pointing to the loo.